− five = 2 Required Please enter the correct value. The Dow Jones Industrial Average popped 196 points on rumors that the United States and China were making progress on a trade deal. China's Vice Premier Liu He suggested this morning (Dec. 11) that he and U.S. Treasury Secretary Steven Mnuchin are working to de-escalate the ongoing trade war that has paralyzed markets over the last six months. This morning, various news agencies reported that China would slash tariffs on imported American automobiles from 40% to 15%. The news helped push shares of Ford Motor Co. (NYSE: F), General Motors Co. (NYSE: GM), and Fiat Chrysler Automobiles NV (NASDAQ: FCAU) up about 2% this morning. The news also helped offset concerns out of Great Britain, where a vote on Brexit was called off due to a significant amount of opposition to Prime Minister Theresa May's plan to withdraw the country from the EU. 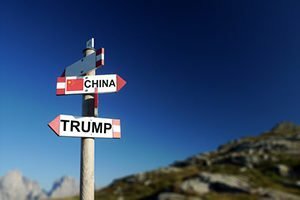 While optimism around a deal between the United States and China is helping to boost the markets, concerns about a government shutdown appear to be a potential albatross. U.S. President Donald Trump plans to meet with soon-to-be Speaker of the House Nancy Pelosi (barring some last-minute challenge from a Democratic rival) and Senate Minority Leader Chuck Schumer about his plans for a border wall. President Trump is demanding $5 billion to build a wall, which was a key election pledge. Former Fed Chair Janet Yellen was doing her best "Chicken Little" impersonation. On Monday, Yellen warned that leverage loans and a variety of other financial products still created big problems for the global financial system. "I think things have improved, but then I think there are gigantic holes in the system," she said. Yellen, who works at the Brookings Institution, warned about the role of deregulation in a potential crisis in the future. Right now, even with all the market uncertainty, there's truly a ridiculous amount of money to be made from stocks if you follow this secret. It's a secret that, as you'll see, is unique in the entire history of investing. It's a method that gives you a real chance to ONLY buy well-positioned stocks expected to go up. And because nobody understands your financial needs and time horizons for retirement better than you do, it's also a method that gives you the opportunity to make as much money as you see fit. Amazon.com Inc. (NASDAQ: AMZN) has every single company in the world in its sights. The latest news came from The New York Times, which stated that the e-commerce giant is making a move into the world of semiconductor manufacturing. The news puts companies like Intel Corp. (NASDAQ: INTC) and NVIDIA Corp. (NASDAQ: NVDA) on notice. Shares of Stitch Fix Inc. (NASDAQ: SFIX) plunged 19% after the company reported earnings on Monday. Although the firm beat earnings estimates of $0.10 per share (when consensus was $0.03 per share), trading turned south quickly on news that the online stylist's subscriber numbers are stagnating. The company doesn't expect to hike its user base during the holiday season, news that underwhelmed investors. In earnings news, shoe retail giant DSW Inc. (NYSE: DSW) shattered earnings-per-share (EPS) and revenue expectations. Shares popped 13% after the firm reported EPS of $0.70, a figure that topped expectations of $0.51. The firm's revenue and same-store sales also topped expectations. Look for earnings reports from American Eagle Outfitters Inc. (NYSE: AEO), Dave & Buster's Entertainment Inc. (NASDAQ: PLAY), and Francesca's Holdings Corp. (NASDAQ: FRAN).